Look at a word, and what do you see? A jumble of letters, sounds; perhaps a stray verb tailing here, or a snippet of onomatopoeia there. English is a notoriously difficult language to learn to a high level, and not least because a lot of the time its words appear to make absolutely no sense. This is the language which spells words such as “trough” “through”, and “though” in almost the exact same way, after all. Just look at the poem The Chaos by Gerard Nolst Trenité, if you would like more examples – indeed, read it and weep. A non-English speaker coming to the Latin alphabet in its Anglosphere form could be forgiven for thinking, on first impression, that this language has been mutated beyond all repair, and should have been left outside to die in the cold when it was spawned back in the 14th century. To add to the confusion, the real meanings behind English words are also more obscure than those of, for example, English’s cousins in mainland Europe. Ours is a bastardised language; it created meaning out of a melange. As a result, most words end up being more than the sum of their parts to English speakers, simply because the parts on their own mean very little to us nowadays, seeing as most Anglophones have neither the opportunity nor the inclination to study Latin or Old High German. Fair enough; life is short, tempus fugit, carpe diem (and any other number of inspirational phrases regularly tattooed onto the biceps or lumbar region). And then there are languages such as Mandarin which, for all it lacks an alphabet and subsequently devastates the morale of learners everywhere, is at least quite logical in its lexical composition. Characters regularly combine to form new words with obvious meanings. 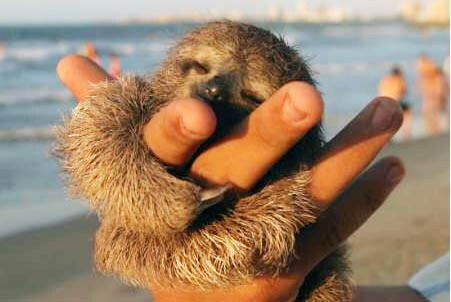 Take the word “sloth”, for example: in Mandarin, sloths are known as “樹懶”, which literally translates to “tree-lazy”. Imagine if more English words made as much sense as that – it would be like having a language made up of words such as “starfish”, “basketball”, and “cupcake”. A logician’s heaven. Yet what if English is actually already like that? Tree-lazies: they grow on you. “Sloth” is not merely a word devised by some petty zoologist who wished to make children with lisps suffer; nor is it merely five letters thrown together and declared to have meaning. It’s actually derived from Middle English’s slou, or slowe, which – spelling reformation aside – clearly equates to today’s ‘slow’. So maybe English isn’t quite the illogical evil which it is often made out to be in language circles; indeed, perhaps one’s reading of it simply depends on perspective, and learning just a little bit about the parts of words which draws the larger picture together. For example: Perspective. Perspective; perspicacity; prospective; circumspect; expect; spectrum. Look up any one of these in the Online Etymology Dictionary, a.k.a. your new best and most perspicacious friend. Latin’s specere means ‘to look at’; ‘to view’. This ties back to specchio – Italian for ‘mirror’. Spectator. Spectacle. The “Specsavers” optical retail chain. “Specs”, a slang term for glasses. English isn’t merely made up of one letter being slotted after the next, and of meaningless syllables being lumped together to form random sounds. Perspicacity didn’t always have the second meaning of ‘intellectual keenness’. No; ‘perspicacity’ grew from a Latin word relating to vision. Understanding English, therefore, is not about cleverness. It’s not about guessing, and it’s not about tests of memory relating to words which expose no immediate meaning. Ultimately, all it really comes down to is one’s ability to see what is already there; one’s ability to read patterns in the alphabet soup. And who knows what we might find?